Jacob is now five week's old, I have been wanting to write his birth story for week's but being a busy mum of three I just have not had any time at all lately. I was induced with Jacob at exactly 39 week's pregnant due to having high blood pressure in pregnancy and being on medication to control this. You can read all about my induction experience and the lead up to the actual birth here. I had been in the hospital since 11am and the day seemed to drag waiting for labour to start, it was a strange feeling knowing that I would be having my baby within 24 hours of arriving at the hospital. Even though I had given birth twice before I was expecting my labour to be long, I think I was half expecting something to go wrong in labour due to being induced before my due date. I had been feeling really uncomfortable since I had the pessary inserted at 12pm but there was no sign of labour. After my waters were broken at 6pm I felt lots of pressure type pains at the bottom of my bump, once I was moved to the delivery ward at 7pm these started getting stronger. They did not feel anything like contractions I had experienced in my previous labours. I still thought that labour was hours away at this point and that I would not have my baby until the following day, but I think I must have known something was happening as I refused to let the other half leave me at all to go for a coffee break. At 8pm there were concerns for my blood pressure as it was getting higher and higher, I was hooked up to monitors to keep an eye on baby's heartbeat and it was found I was contracting seven times every ten minutes. So the doctors were called and they were thinking of giving me drugs to slow down my contractions, thankfully lying on my side on the bed slowed them down a bit. But the doctors were not at all happy with my blood pressure and they told me it was dangerously high and I was at risk of a bleed to the brain if they did not lower it, so a cannula was inserted in my hand, blood was taken and I was injected with blood pressure medication to try and lower it. At this point I was still not in established labour, I was getting contractions and they were two minutes apart but they weren't showing up as strong on the machine and I was not in pain. The contractions just felt like a lot of pressure at the bottom of my bump. By now it was about 8.50pm and the contractions were getting stronger and I was starting to feel tired so I asked for some diamorphine to help with the pain. By now I had a different midwife, as they had a shift change and she examined me and said I was 5cm and she would get me some diamorphine. I was given the diamorphine at about 9.15pm and told that it would take half an hour to work. No sooner had I had the diamorphine and I started going a bit crazy saying I couldn't do it anymore I didn't want to give birth as I knew it was going to hurt. As soon as I started saying this the midwife quickly started setting her trolley up and getting everything sorted for the baby's arrival, said the baby would be arriving soon as I was in the transition stage. She asked if I wanted to push, I said yes but I'm not going to or you will take the gas and air from me. She said I could keep the gas and air if I pushed as the baby was not happy, his heart rate was starting to drop. While this was going on my blood pressure was still dangerously high and I was getting my blood pressure taken every ten minutes, and being injected with blood pressure medication to try and lower my blood pressure by the doctor who was in the room the whole time. She was concerned about it and she was keeping an eye on baby's heart rate too. I was examined again and told I was only 7cm but if I felt the need to push them to just go with what my body was doing, so I pushed and I remember not wanting to as I knew it was going hurt. The midwife, doctor and the other half were all telling me to push, I glanced over and seen the heart rate machine drop from 150 to 80 so I knew I had to get the baby out quickly. His head came out and they were telling me to push quickly to get the rest of him out, I didn't know this at the time but it was because the cord was around his neck. After a few more pushes baby was born, he was passed straight to me and the midwife said he is defiantly a boy as I had not been convinced he was. He was passed to me and he let out a little cry and then started making strange noises and was not breathing, I started to panic. The midwife quickly cut his cord and told the doctor to go and get help and started rubbing him on the back, thankfully he started to scream and I eventually got to give him cuddles. As soon as I give birth my blood pressure dropped back down to normal, I think it was just so high off the pain of labour. The blood from the baby's cord was tested in a machine, due to his heart rate dropping in labour, thankfully everything was ok although has Apgar score at birth was quite low. Then we were left on our own in the room with our baby boy for a while, cuddling him and getting to know him. We were brought tea and toast which was lovely as I was starving after giving birth, and Jacob demolished a bottle of milk. He was then weighed and he was 8lb 6 1/2 oz, so much for the small baby that they kept saying that I was having throughout my pregnancy, he was my biggest baby! Jacob was then dressed and checked over, his temperature was low so he was wrapped up in blankets and we were told to cuddle him to try and warm him up. We went to the postnatal ward at around 1.30am where we had to spend two days, as the doctors wanted to keep an eye on me for 24 hours after birth due to my blood pressure. Jacob also had hypothermia and needed to be kept warm in a specially heated cot and needed to be monitored too. 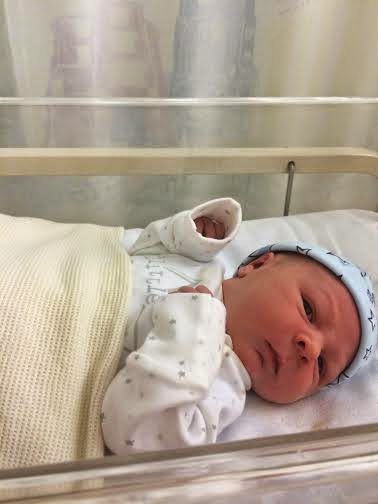 So that is how my little boy, Jacob entered the world at 9.31pm weighing 8lb 6 1/2oz. My whole labour was recorded as being 1 hour and 1 minute long from being 4cm to delivering the placenta but was only 40 minutes from being 4cm to Jacob being born, it was so quick and the easiest of all my births. Looking back now at how high my blood pressure was and Jacobs heart rate dropping it was probably my most dangerous, I am just glad that I was not fully aware of how dangerous things were while I was in labour and that Jacob was born as quick as he was. Two day's after he was born we were able to take him home and start our new life as a family of five.